RIT students Dan Plate, middle, and Gary Porter, right, won first place in the games category of the 2015 U.S. Imagine Cup National Finals. Two Rochester Institute of Technology students took a top prize in Microsoft’s U.S. Imagine Cup National Finals and will now go on to compete for bigger prizes in the upcoming World Semi-Finals. Dan Plate and Gary Porter, best friends since high school, won in the games category for their co-creation, Super Daryl Deluxe. The prize, awarded last night at the competition in San Francisco, is $4,000. Plate and Porter, both from Waterloo, N.Y., will now go on to represent the U.S. at the World Semi-Finals July 27–31. There, they will compete against students from more than 100 other countries for a spot in the World Imagine Cup Finals and a chance to win $50,000 and prizes. Super Daryl Deluxe is a 2D action role-playing game featuring a unique combat system and visual style. A free demo is available on the Super Daryl game website. Porter and Plate, a fourth-year illustration major, have been working on this video game for three years. They have created a company, Dan and Gary Games, which is being incubated in RIT’s MAGIC Spell Studio, a division of the Center of Media, Arts Games, Interaction and Creativity (MAGIC), which is charged with helping RIT students take their ideas and get them in production. The game will be published and released within a year. This is the second award for Plate and Porter, who won first place in the Visual Quality category of the 2015 Intel University Games Showcase in March. Plate and Porter entered the game demo into the Imagine Cup competition earlier this school year and won several stages to make it to the U.S. National Finals. Twelve U.S. finalist teams went head-to-head in the San Francisco competition, in the three categories of Games, World Citizenship and Innovation. Each team had five minutes to pitch their project and then five minutes of Q&A with the judges. Running annually since 2003, the Imagine Cup is Microsoft’s global student technology competition that challenges students to build games, apps and solutions to real-world challenges. The competition also featured an expo for teams to showcase their projects to the public and talks with Larry Orecklin, vice president of Developer Evangelism at Microsoft, Matt Thompson, general manager of U.S. Developer Experience at Microsoft and others. For more information on the competition, go to imaginecup.com. 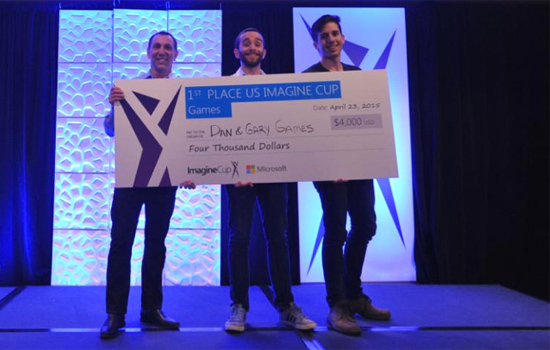 More information about the other Imagine Cup national finalists is available online.